I tried out Project DragonFly on the Lab site. It was amazingly easy to use. The online interface was easy to figure out and there was enough content to make a go of it. Obviously this is not a tool for the architectural crowd out there, but it is rather fun. You could use it to fiddle around with things at home or to envision something in 3D for kicks. It is all browser driven and fairly responsive. Dragonfly is interesting to mess around with. No prior knowledge of computer aided design is required to join in on the fun. The simple-to-use interface and intuitive design allows you to easily drag and drop items into floor plans that you’ve created. When you’re done, save it and show friends your masterpiece. 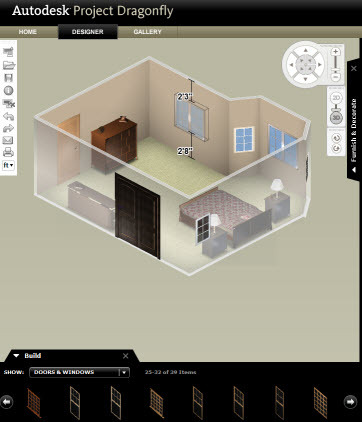 Easily modify structural elements like walls, doors, and windows in a click. Move walls, add or remove doors, windows, openings — and even entire rooms — in real time. Then visualize your design using the 3D viewing capabilities to better understand how changes affect your space. Jumpstart your remodel by using one of our furnished sample designs, or you can select from one of the many that others have saved in the gallery. Just open it up for editing, make your changes, and save it. It’s that easy! Use our sample room shapes to quickly lay out your floor plan. 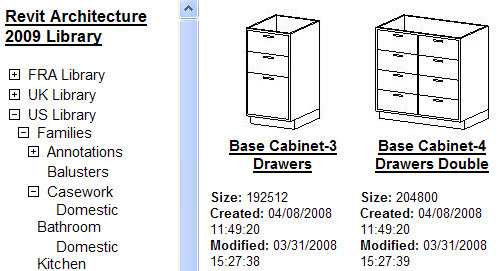 Simply drag and drop additional rooms, closets, walls, doors, windows, openings, and other items from our Build catalog into your floor plan to rapidly create your design. Project Dragonfly makes it easy to match your existing space or create your dream home. Plan your space with furniture selections from our Furnish & Decorate catalog. 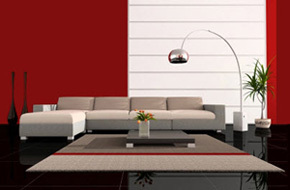 Choose from a variety of generic furniture options by dragging and dropping items into your floor plan. This feature allows you to experiment with furnishing choices and layout options. Amy Fietkau shows you how solutions can help simplify designing, drawing and documentation tasks in her live webcast series! Revit Architecture is purpose-built for building information modeling (BIM), allowing you to work the way you think and enabling you to design freely and deliver efficiently. Want to learn more? Watch the "Top Tips for Implementing Revit Architecture" screencast and learn to keep your designs and documents coordinated and complete. I am re-running a poll from this time last year so that we can compare the results. Have things changed in a year? Are you using different software now than at this time last year? Have you moved from one software title to another one? What BIM Tools do you use? Take the poll on the main page of the CADD Manager blog site .